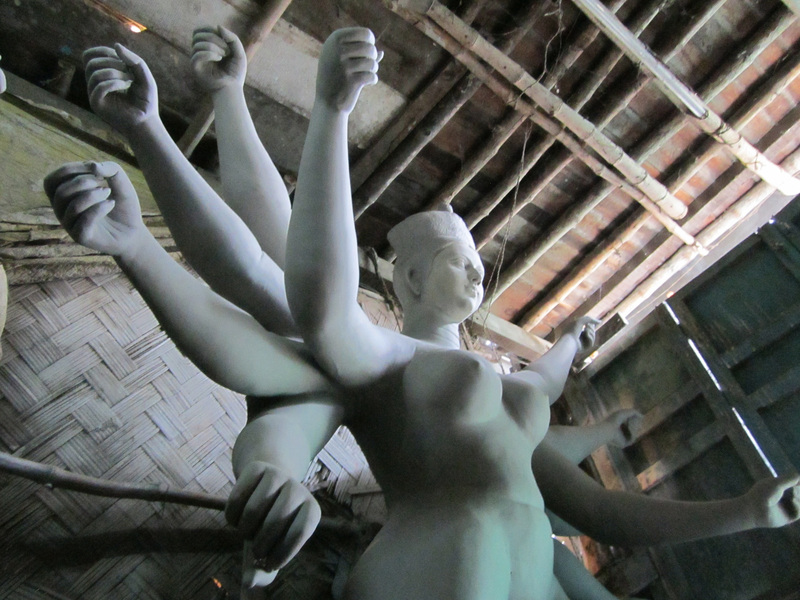 On the morning of my second day in India, I had the great fortune to make my first trip to Kumartuli, which is a neighborhood of image-makers that is located slightly north of the center of Kolkata. Leading the way was the delightful Partha Dey, a Kolkata native and visual artist who was a Fulbright Scholar at the University of Iowa a few years ago. 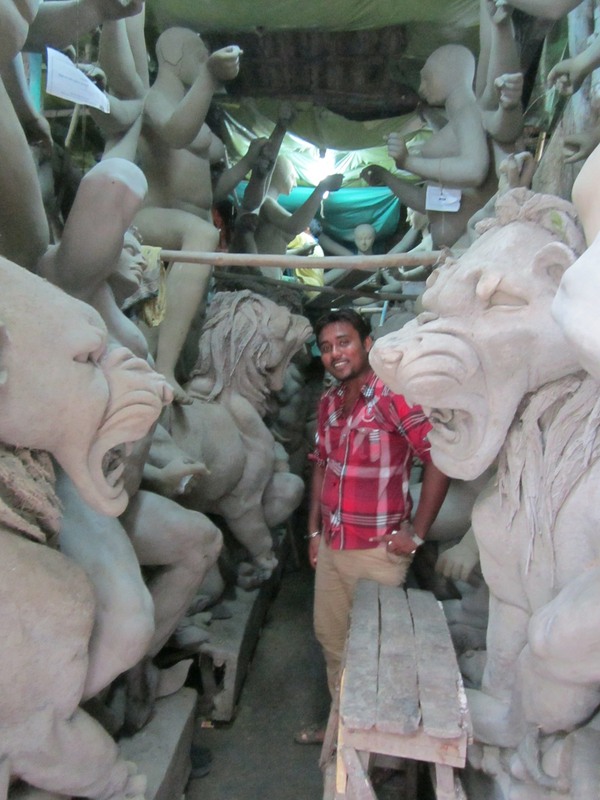 Our first stop was at the Shovabazar Rajbari (raj=king, bari=house) to meet Dilipda, a friend of Partha’s and the well-known sculptor who was currently in the process of creating the Durga sculptural tableaux for the annual Shovabazar Rajbari’s Durga Puja celebrations. 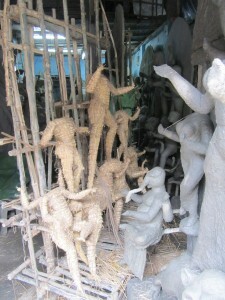 He had already created his figures through the first stage of rough clay and straw formation, so we made arrangements for me to come back when Dilipda would begin his next stage of work. 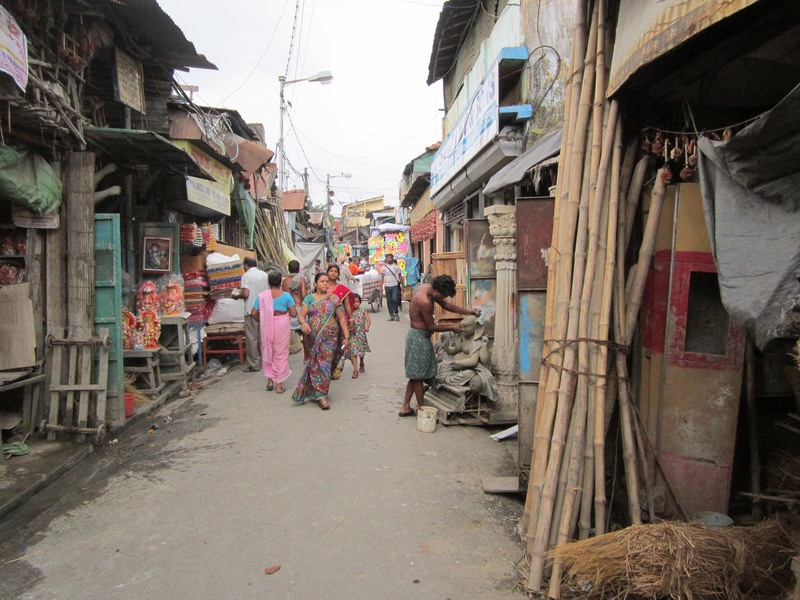 lined with the workshops of many image-makers. 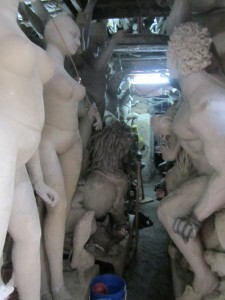 Some workshops are tiny spaces, some are so narrow that we marveled at how the sculptors can gain any sort of perspective on the figures as they work! 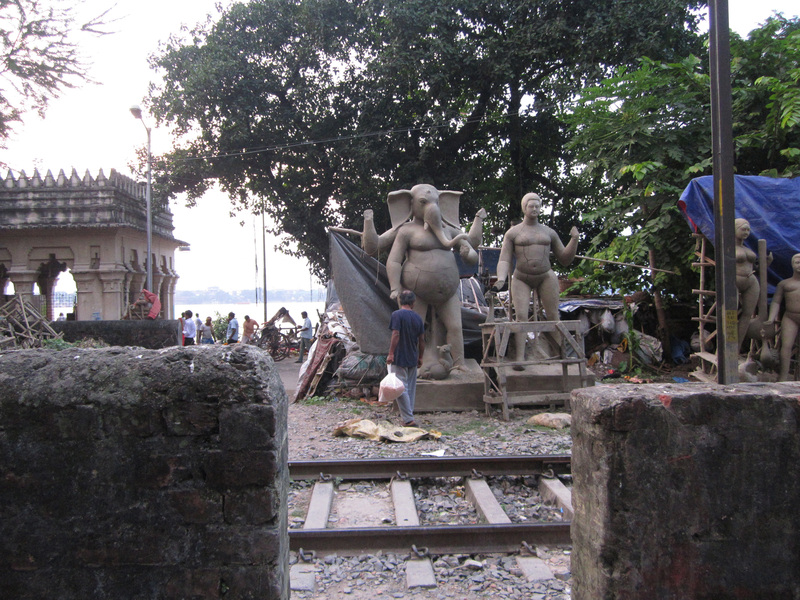 Look at the size of some these sculptures! 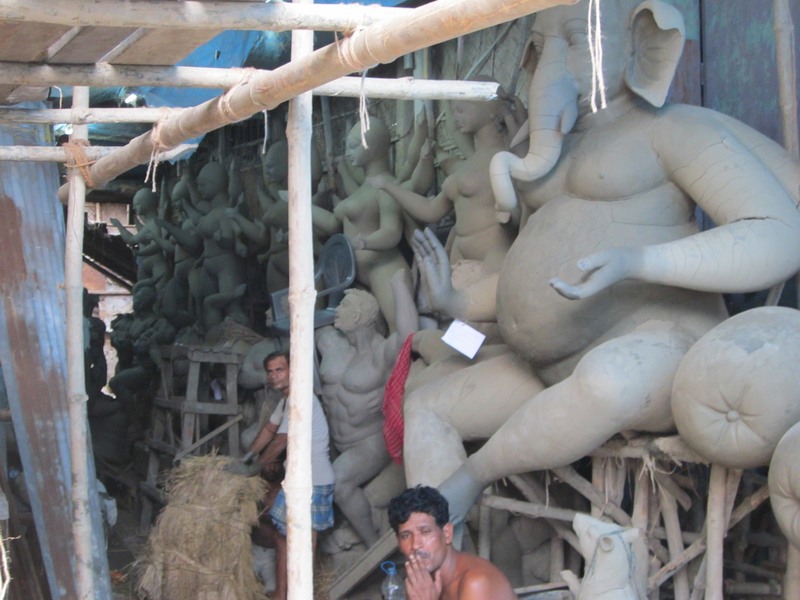 In the time before I left for India, I had been concerned that I was arriving so close to the date of the celebrations that all of the images being made for Durga Puja would be so far underway that I would miss the chance to witness the whole process. Happily, these concerns were unfounded! Images were in every state of progress. The foundation of each image is built using split bamboo as a support structure, to which basic forms of straw wrapped with jute are added to make the rough figure. 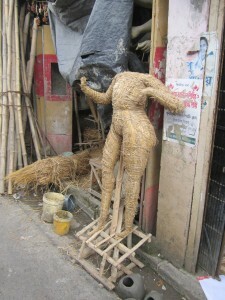 Then a first layer of clay mixed with straw for strength, is added to the straw figure. Once this dries, a second layer of smooth clay (in Kumartuli, this clay is taken from the banks of the Hooghly river) is added to the image to allow for more refinement and detailing. 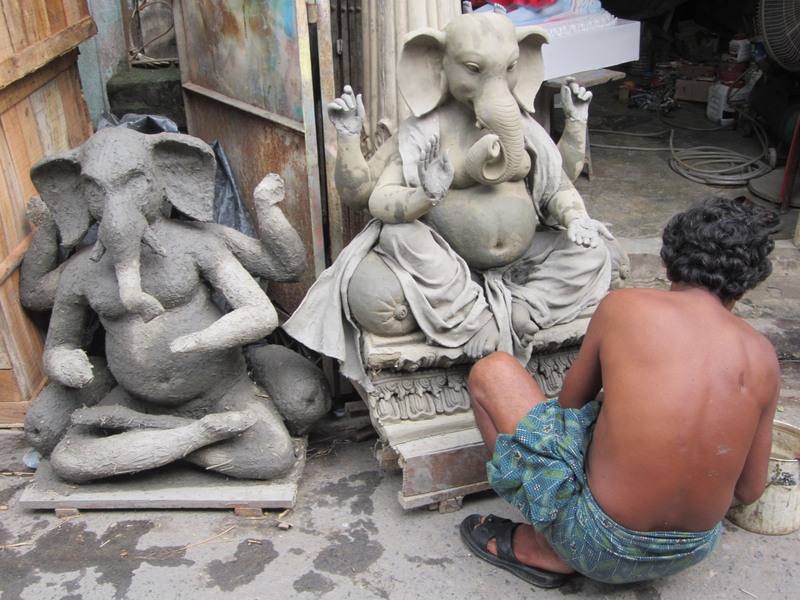 The photo below depicts this difference between clay/straw and smooth clay layers in two Ganesha images. 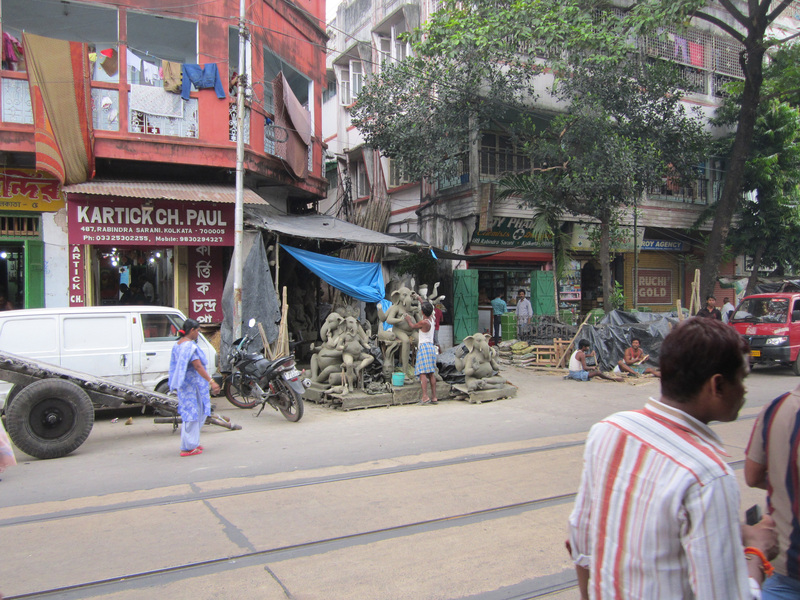 Workshops are everywhere, in houses, shops, street side, and even right next to the train tracks. 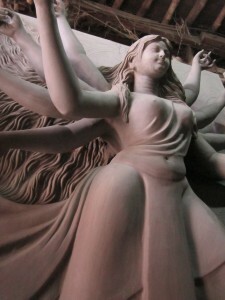 I’m excited to learn more in the coming weeks before Durga Puja. This is marvellous stuff! So interesting and we are looking for some Indian potters/ceramists to bring into the IAC so any names etc – be great! Keep up the good work and well done! Thanks! I’m glad that you’ve had a look ’round the blog. I’m looking forward to seeing you in August! Such an expanding experience both in personal and artistic growth! Looking forward to more of your blog!